Hello, lovely! I hope you are doing well. Holy COW! My iFundWomen campaign is still going on, I cannot thank you enough for the out poor of love & support. Just shy of a month ago my friends Sarah & Kevin got married & it was such a pleasure throughout the entire process to be by their sides. I did an instagram poll to see if you would be interested in me given you the skinny on what we did for Sarah's bachelorette & you said heck yes! So here it is the post is finally here! I was maid of honor & like I've said before I'm a planner so I thrived planning this. There were 10 ladies in total including the bride. Why Portland, ME? Well the bride wanted to do something adventurous that shes never done before & she's really into country. I thought Portland was perfect because Bonfire the country bar is right downtown & we could go zip lining! We went the second weekend in May. The weather was beautiful! It was a Friday night to Sunday afternoon. Another friend & I went up early to eat at some of our favorite places before checking in to our air b & b. We hit up Eventide the oyster bar for a oysters & rose. Then we went right up the street to Duck Fat for poutine. My inner fat kid was in heaven. After we got our food fix we checked into our air b & b & decorated! The location of our accommodations was perfect! It was steps away from back cove which we took a run on Saturday morning. It was about a 5 minute uber from downtown. Friday night kind of just hung at the house. I grilled for everyone, we played games, & had some beverages! It was fun getting to know the rest of the girls & the bride was able to chat with everyone & just have fun! We needed to rest up for our big adventuring day! Saturday we woke up & went for a scenic run. I made some breakfast & packed sandwiches for the gals. Then we headed to Monkey Trunks in Saco, ME it was about a 25 minute drive from our air b&b. We did a zip lining course including some obstacles which we did in our bride tribe tanks which I got off etsy. We broke for lunch then conquered the rock wall & adventures course! We headed back to the house to rest up for dinner with Holy Doughnuts in hand. After getting ready we headed to David's restaurant for dinner. The bride has a specific pallet & we had a gluten allergy in the group, David's offered something for everyone! (Not to mention they give you these amazing garlic bread knots prior to your meal) After dinner we went to Blyth & Burrows for a drink & ended the night at Bonfire. Bonfire is perfect for the country lover in their life! There are seats made of horse saddles & porch swings. The drinks are served in red solo cups & there is Nintendo for playing! It was all and all a really fun weekend! I would highly recommend Portland, ME for a bachelorette, girls trip, or a trip with your guy! Well dolls I hope you have a great weekend! Who to ask to be in your Wedding? Asking people to be in your wedding can either be a no brainer for some & a piece of cake for others. I found that I got hung up on having 5 bridesmaids & 5 groomsmen. This hang up was foolish because it left special people out. Down the line I finally was like we are asking the people & that's that. 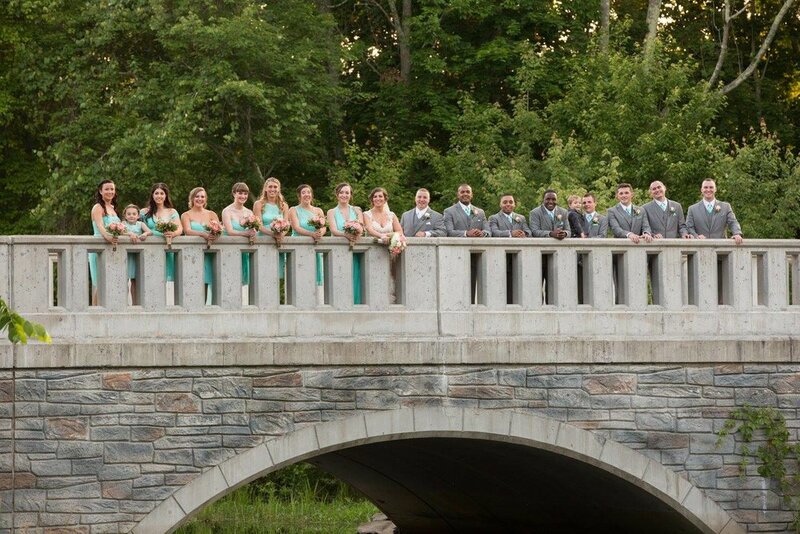 I had a pretty large bridal party but I wouldn't have had it any other way. Each person standing with Ricky & I had been thru a lot with us at different times in our lives, all equally important to us. The MOH has a lot of responsibilities between assisting the bride, planning the bridal shower, bachelorette, & making sure the rest of the girls are on board. This is typically a sister or close gal pal. I asked my sister to be my right hand, not only is she my sister by blood but we happen to be really close friends by choice. The nice thing about asking a sister I feel opposed to a friend is that your other friends won't be upset if you didn't ask them & your sister most likely has more tolerance for you when you are going into bridezilla mode. (I like to think I never got in bridezilla mode) If you don't have a sister fear not! Ask your bestie, someone who can handle the planning & responsibilities. Stuck between a friend & sister? Well there is a fix. If one of them is married make them your matron of honor & the other unmarried girl your maid of honor. They can both share the responsibilities. As I mentioned prior I really got hung up on the number of girls standing up there with me. I would advise anyone not to do that. 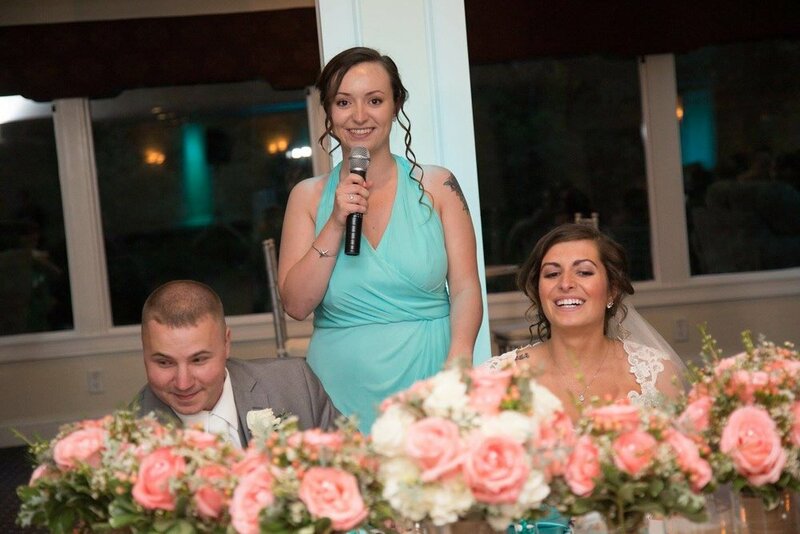 Even if the bridesmaids & groomsmen are uneven who cares it's 2016! One guy can always walk down 2 girls or vise-versa. Bridesmaids, I would ask anyone that you are super close with & that you see will be in your life for a long time. God willing you only get one wedding & you want to make sure you don't leave people out or have someone in the bridal party who isn't your close to you. I had girls by my side who I've known since middle & high school, who I met thru church, I met one of girls when we worked at a coffee shop together, & one of my bridesmaids was my husband's cousin(we were friends before I met him). Every bride is different but these girls know me, they have been with me thru my ups & downs. I couldn't picture my day without each one of them. These girls are ultimately going into the next chapter of your life with you. Well Fash Dolls I hope this has helped give clarity to some & of you are not a future bride yourself keep this in mind for the future or share this with someone!